Kärråsen was built in 1846 by a nail smith who worked at the factory of Torsby near Herrgårdsparken (Thorsby Bruk). 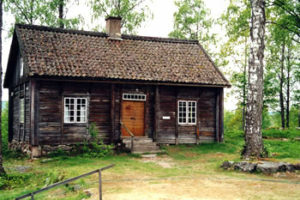 It was a poorhouse for a number of years, until Torsby Municipality donated it to the newly established homestead museum of Kollsberg in 1923. A year later, the building was the first to be raised on the museum grounds. The house has two rooms, one on both sides of the hall and each with its own stove. The room to the south is furnished as a simple smith’s dwelling, while the room to the north is decorated as a traditional rural schoolhouse.